These days all the projects that are upgrading from .net 2.0 to .net 3.5 or to .net 4.0 are facing the issue of choosing between web-services and WCF (Windows Communication Foundation). 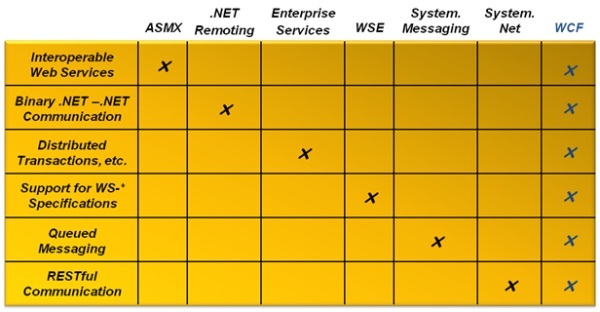 In this post I am going to discuss the difference between them and look at points which would make clear what to choose and throw light to web-service vs WCF issue. .
WCF is a part of the .NET Framework that provides a unified programming model for rapidly building service-oriented applications that communicate across the web and the enterprise. 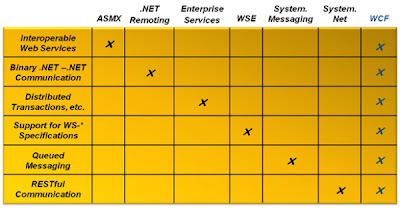 ASP.NET Web services was developed for building applications that send and receive messages by using the Simple Object Access Protocol (SOAP) over HTTP. The structure of the messages can be defined using an XML Schema, and a tool is provided to facilitate serializing the messages to and from .NET Framework objects. The technology can automatically generate metadata to describe Web services in the Web Services Description Language (WSDL), and a second tool is provided for generating clients for Web services from the WSDL. 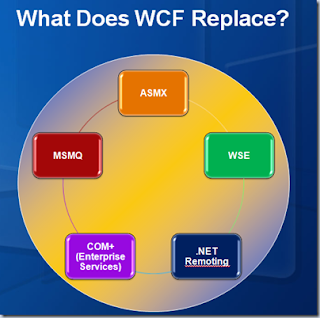 WCF is for enabling .NET Framework applications to exchange messages with other software entities. SOAP is used by default, but the messages can be in any format, and conveyed by using any transport protocol. The structure of the messages can be defined using an XML Schema, and there are various options for serializing the messages to and from .NET Framework objects. WCF can automatically generate metadata to describe applications built using the technology in WSDL, and it also provides a tool for generating clients for those applications from the WSDL. 1. WCF is architecturally more robust and promotes best practices. 2. If you know what you are doing its "silky smooth" if not you are in for a ride. 3. Do you have enough time to complete the conversion of your services? 1) No matter how you decide this for the server-side, you can easily consume Webservices and WCF Services using only WCF on the client-side. This is of value, if you consume multiple services with a single client. 2) If you consider Cloud Computing: It is possible to host WCF Services on Windows Azure. Finally I would say that, if you have the time, the bling and the muscle to do the upgrade. Its worth it. If asmx is satisfying all the needs, you may persist with web services. WCF remedies this - and offer much more beyond that. You can host your WCF services in IIS - or self-host in a console app or Win NT Service, as need be. You can connect your WCF services using HTTP, TCP/IP, MSMQ, Peer-to-peer protocols, named pipes for on-machine communications and much more. I'd definitely recommend you go with WCF. It's a tad more complex than ASMX, but it also offer just sooo much more capabilities and choices! * Only Public fields or Properties of .NET types can be translated into XML. * Only the classes which implement IEnumerable interface. * Classes that implement the IDictionary interface, such as Hash table can not be serialized. * A practical benefit of the design of the DataContractSerializer is better performance over Xmlserializer. * XML Serialization does not indicate the which fields or properties of the type are serialized into XML where as DataCotratSerializer Explicitly shows the which fields or properties are serialized into XML. * The DataContractSerializer can translate the HashTable into XML. 3) We were able to create AJAX-supporting RESTful web services with only configuration changes and using the DataContractJsonSerializer that's already built in. To do this otherwise, we would have had to write an HTTP Handler (ashx) and handle most of the Json serialization and url parsing by hand. 4) As our site needs to scale for performance optimization and stability, we are looking at converting to using an MSMQ-based messaging structure that is asynchronous AND guaranteed and participates in transactions; WCF provides an MSMQ bindng that requires little-to-no code change in our services--just reference updates and setting up MSMQ properly with the existing services (and adding attributes for Transactional boundaries). BUT BE WARNED: Really invest in learning this. There are things like argument-name-changes during development that actually don't break the service references but result in null arguments being passed (built-in version skew handling), hosting models to consider (Windows Service vs. IIS), and instantiation models and FaultExceptions to all REALLY understand. We didn't going in and we had some pains. But we plowed ahead and are VERY happy with our learnings and the flexibility and growth opportunities we have not being tied to ASMX anymore!